Using The Art & Science Of CSS, you’ll see just how easy it is to unleash your creative talents and design inspirational web sites with CSS. All designs in this book are visually appealing and inspiring. The CSS code used to create each of the components is included and guaranteed to be simple, efficient and cross-browser compatible. 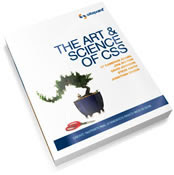 The book’s full-color layout and large format (8" x 10") make this one of the most usable and enjoyable CSS books available.